The purpose of the Therapeutic Goods Administration's (TGA) Regulatory Compliance Framework is to outline to stakeholders how the TGA manages its compliance function under its legislation. This Regulatory Compliance Framework sets out the TGA's overall approach to compliance. The TGA was established to safeguard and enhance the health of the Australian community through effective and timely regulation of therapeutic goods. It does this through the application of the Therapeutic Goods Act 1989 (the Act). The Act outlines a risk based regulatory framework for therapeutic goods, with the level of regulation reflecting the assessed risk of the product. Therapeutic goods on the market in Australia are required to be manufactured to an appropriate quality, and while no therapeutic good can be considered risk free, when used as intended the benefits of any product should outweigh the risks associated with its use. To be included in the Australian Register of Therapeutic Goods (ARTG), higher risk products must demonstrate that they are effective in treating the conditions for which they are approved; low risk products need only demonstrate that they are of acceptable quality and do not present significant safety risks. The TGA actively monitors the quality, safety and performance of therapeutic goods when they become available to consumers to ensure the on-going compliance of the products with TGA’s regulatory requirements and has an on-going program of verifying the suitability of manufacturers to produce therapeutic goods for supply in Australia. The TGA also actively monitors unlawfully supplied products and takes appropriate regulatory action where these are identified. This Framework outlines the TGA's general approach to ensuring uniform and proportionate responses where non-compliance with regulatory requirements is identified. Australians have a right to expect that each of the medicines they take and the medical devices they use meet acceptable levels of safety and quality. One of the roles of the TGA is to regulate therapeutic products based on a scientific and clinical assessment of the evidence of both the risks and the benefits of those products. It is important to recognise that in doing so, the TGA cannot avoid all risks - that would be impossible - but that its approach is about managing risks, so that the impact of any risks identified in relation to a therapeutic product are kept to an acceptable level. The TGA uses this same risk-based approach in its monitoring and compliance activities. There are several different sources of risks that can arise in relation to therapeutic goods - they can be product risks (risks that are inherent to the product), compliance risks (risks occurring from products failing to meet requirements), and unlawful products (risks of unauthorised products). The TGA employs a combination of monitoring strategies to support its compliance program. Underpinning all forms of monitoring is the legislated requirement for sponsors to monitor the performance of their products in the marketplace and, where higher risk products or serious health issues are involved, to report problems to the TGA in a timely manner. The TGA uses its strategies to monitor the market for signals of potential non-compliance across the range of regulatory areas covered by the Act. 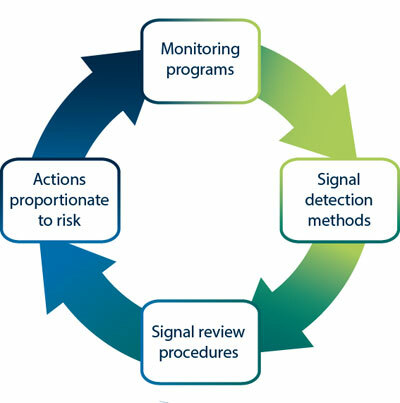 The TGA employs a uniform risk-based approach to determining the significance of any signals detected and the appropriate regulatory response. An overview of the process of managing signals is provided below. The TGA uses a staged risk-management approach to compliance that attempts to identify entities at risk of unintentional or deliberate non-compliance and enable the development of appropriate strategies to prevent non-compliance. The TGA can communicate its regulatory requirements and compliance expectations quickly and directly to a market-entry applicant and can deny market access to applicants who cannot demonstrate compliance with these requirements. Providing regulatory education to applicants at or before this point can help to minimise non-compliance once a product is marketed. It is the TGA's policy to publish information about regulatory compliance decisions and actions on its website. The majority of TGA stakeholders comply with TGA requirements. Through interaction with the TGA it is possible to foster understanding of the compliance framework within which they operate and thus facilitate compliance. There may be a need for the TGA to act in the interests of consumers to restrict or revise an indication for use of a therapeutic good. Sometimes this may be based on information from other jurisdictions. The identification of more serious contraventions of the TGA Act and/or Regulations may require therapeutic goods to be suspended from the ARTG or the sanctions such as enforceable undertakings, to be applied. Some products may be seized and/or cancelled from the ARTG in the event of deliberate non-compliance or discovery of non compliant systems or activity associated with the therapeutic good. The discovery of activities with criminal intent in relation to therapeutic goods - e.g. counterfeit medicines - is dealt with under provisions of the Act and Regulations, not necessarily only through the imposition of civil penalties but also, on occasion, through criminal prosecution. An overview of the TGA's approach to compliance is provided below. "Committed to doing the right thing" "Trying to do the right thing but don't always succeed" "Don't want to comply but will if made to" "Decision to be non-compliant"
TGA's monitoring programs receive signals of possible non-compliance with regulatory requirements from many sources. All signals, including complaints about a therapeutic good, are recorded and considered, but the TGA cannot investigate all complaints received. Once again, the TGA exercises a risk-based approach to prioritise complaints and other signals of possible non-compliance with regulatory requirements, in order to provide the greatest overall benefit for the Australian public. The actions taken by the TGA in response to signals of potential non-compliance will depend on the likely risk associated with the non-compliance. Issues that may have adverse health consequences for consumers as a result of public access to inappropriate or dangerous goods. Issues that may affect TGA's reputation among key stakeholders leading to a loss of confidence in the TGA's regulatory processes and subsequently loss of confidence in available therapeutic goods. Provide information to the party to help deal with the issue and gain a better understanding of the Act. Postpone or cease investigations, where insufficient information is available; with a view to a later investigation once more information is available. Draw the possibilities of contraventions of legislation to the attention of the party and provide information to encourage rectification and future compliance. Place relevant parties on notice about TGA's concerns and the possibility of future actions and investigation should non-compliance continue. Deal with a matter informally, where parties have attempted to correct possible contraventions and provide information to prevent recurrence. The TGA is less likely to pursue matters that are one-off events, unless non-compliance is a deliberate and a blatant breach of the law and/or there are public health consequences. Where appropriate, the TGA works with other agencies in performing its monitoring and compliance functions. This may involve an exchange of information, or more direct engagement in joint investigatory activities.